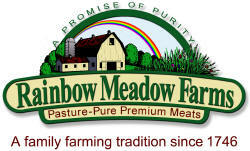 Thank you for your interest in Rainbow Meadow Farms Pasture Pure Premium Meats for your restaurant. Because you're a volume purchaser, we offer special wholesale pricing. If this is your first visit, please take a moment to fill in the form below so that we may know a little about you enabling us to better serve your needs. have direct access to special pricing. We will respond to your inquiry very soon.